← Happy Birthday, José Echegaray! 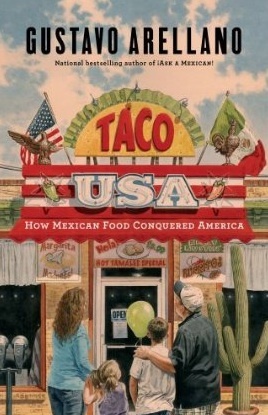 Gustavo Arellano’s Taco USA: How Mexican Food Conquered America (Scribner) is a literary feast. Arellano covers the history of Mexican food, from its origins with the Aztecs to its present-day incarnations at Chipotle. In meticulous detail, Arellano writes about the selling of tamales on street corners, the emergence of the tortilla and salsa, and the creation of the margarita machine, among other topics. A few quibbles: As a Texan, the book seemed a bit California-centric to me. How does the Rio Grande Valley get only one paragraph in a book about Mexican food? Although it doesn’t have the mass appeal of burritos and margaritas, I would have liked to read more about the history of pan dulce and menudo. I also would have liked to see some sociological and cultural analysis of the Americans’ seemingly contradictory anti-immigrant fervor and love for Mexican food. The book left me hungry for that information, but it also made me hungry, literally. After reading the chapter on tortillas, I had to go to Chipotle (the closest available Mexican food place) for dinner. Savor Taco USA. It’s as delightful as the meals Arellano describes. Gustavo Arellano, the editor of OC Weekly, is best known for his Ask a Mexican column. He also teaches at California State University, Fullerton. Source: I purchased this book through Amazon.com. There are few things in this world that I love more than a good lengua taco. My mouth is watering just thinking about it. With a tall glass of horchata. On the TBR this book goes, even if it’s not quite as comprehensive as it should be.